Last June we went to Morocco for a 5 day trip. This was our first time in Marrakech, and as everyone says: it is a place that you will either love or hate. Our feelings are right there, in the middle. There are certain things that we loved... and a few others that we didn’t like as much. Part of the reason why we didn’t get to enjoy the city to the fullest is that we were there during “ramadan”. So everything adapts to it, meaning that restaurants open later and close earlier… there is nothing going on in the morning till around 12pm, at certain times of the day they gather to pray so everything shuts down, and people can get really grumpy. Can you imagine not eating, but especially not drinking any water in the Moroccan heat? Even locals were telling us that this was the worst time of the year to visit, which is why not too many tourists were around and we felt out of place. On our first day, we tried to explore The Medina on our own, but this soon proved to be extremely hard. We kept getting lost in the tiny alleys, and when locals noticed we were lost they started bothering us and harassing us by telling us to go here or there, to get money in return. Also: if you have blond hair and very fair skin it’ll be really hard to blend in, and it’ll make you feel uncomfortable at times. The night we arrived, we met a lovely girl from Texas, and she said she jokingly said she even considered dying her hair dark for the trip as everyone was staring; especially during a low season! 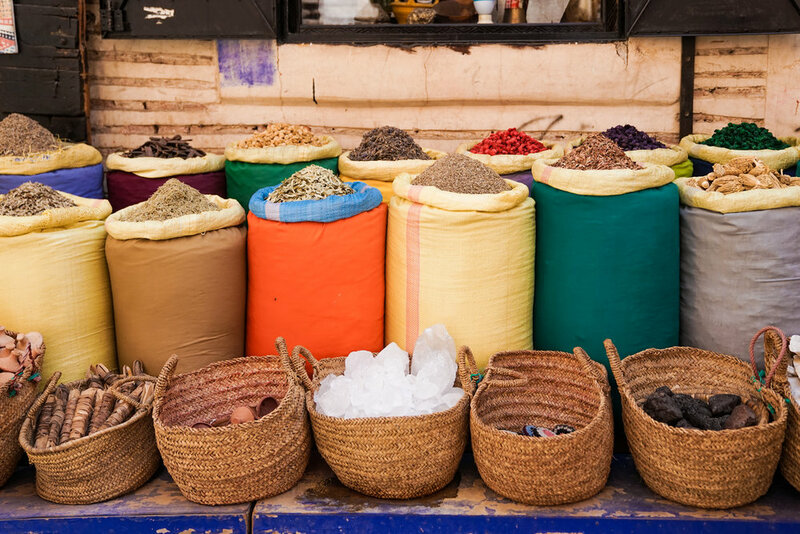 When you explore The Medina, what we suggest is to hire a guide that will take you around, this way not only will you not get lost but also locals will be less inclined to harass you. ut, on a brighter note… we completely fell in love with all the beautiful places we visited and with the colors and smells of The Medina. 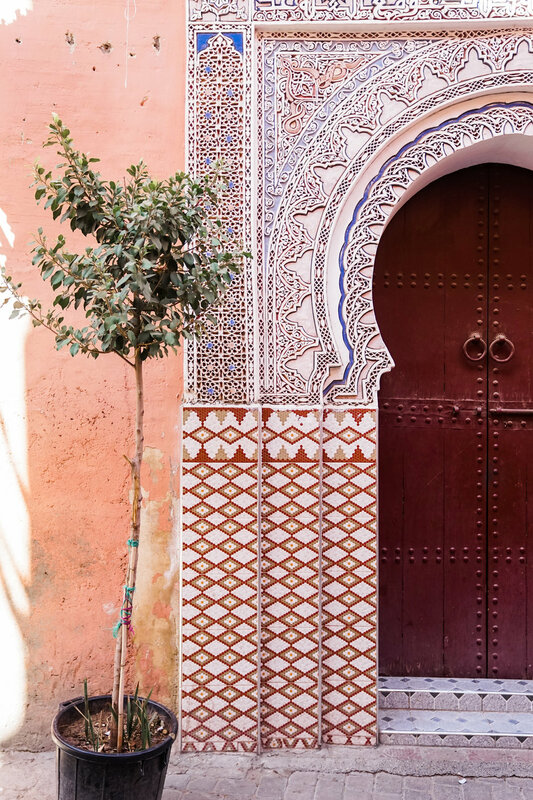 Marrakech is known as the red city of Morocco, because almost every building is in salmon pink, and it’s perfect for taking good photos! We spent the first two nights at a riad, Riad Dar Darma, which was quite the experience! All the riads are gorgeous, so we decided to visit a few of them. For the rest of the trip we stayed at La Mamounia, it’s a very famous 5 star hotel located 10 minutes away from The Medina, but it honestly feels like you could be in the most peaceful and quiet corner of the world - as you don’t hear any noise from the outside. It was elected “Best Hotel in The World” by Conde Naste Traveller’s readers, and after visiting so many beautiful hotels these past few years, we can honestly agree with that. It’s definitely one of our favorites hotels to date, and certainly one where we keep dreaming of going again! One of the things you will immediately notice is the delicious scent that takes over the huge property. It’s a mixture of Atlas cedar trees, dates and fresh citrus… but you have to smell it with your own nose to really get the feel of how good it is. Once we checked-in, we know we didn’t want to leave. And the hotel is so big, you can walk around for hours! We did a tour all around the space, and the huge spa, the gorgeous pool, and all the attention to every single detail (from the blue colored walls in the gym, the magnificent tiles and the kindness of the staff) will stick with you long after your departure. Jardin Majorelle: designed by the french artist Jacques Majorelle in the ‘20s, and owned by Yves Saint-Laurent since the ‘80s, these botanical gardens are a must visit if you’re in Marrakech. The blue cobalt walls speak for themselves! 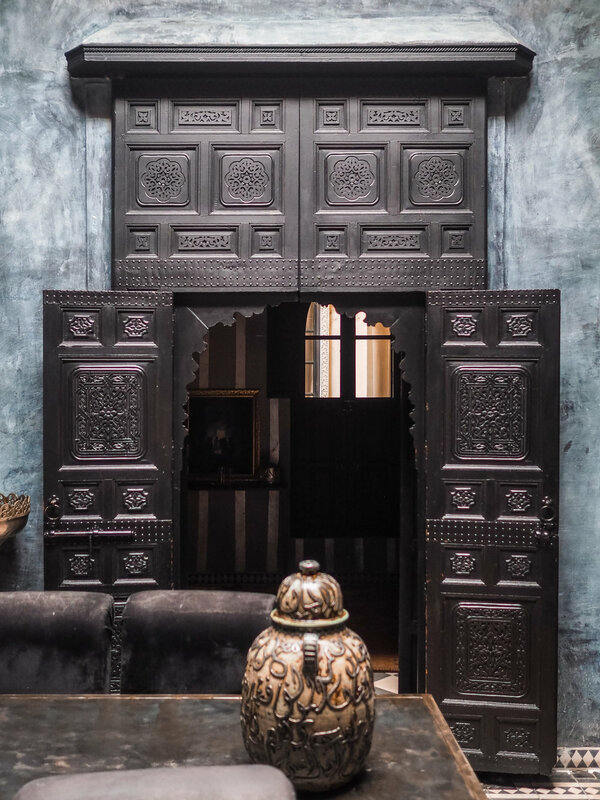 Riad BE Marrakech: there’s not too much to say in regards of this place… just look at the photos and you’ll be able to tell why we loved it! Madersa Ben Youssef: an old Islamic college, famous for its beautiful mosaics, tiles, doors and windows. Don't forget to take a picture from the opposite side of the marble patio. 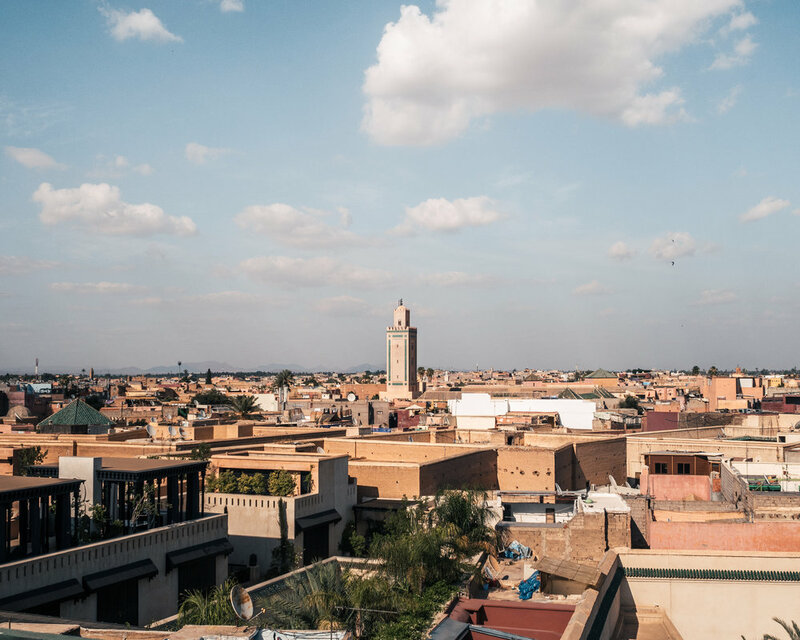 NOMAD: Spread over 4 floors, with two terraces that offer views of the surrounding Medina and Atlas mountain range, Nomad is perfect for both lunch and dinner, or to simply repose from the hustle and bustle of the souks with a much-needed drink. Le Jardin: as you can tell by the name, this place is literally a garden, extremely lush, with gorgeous greens and delicious food everywhere. It’s a nice place to relax after getting lost in the labyrinth that is the Medina! 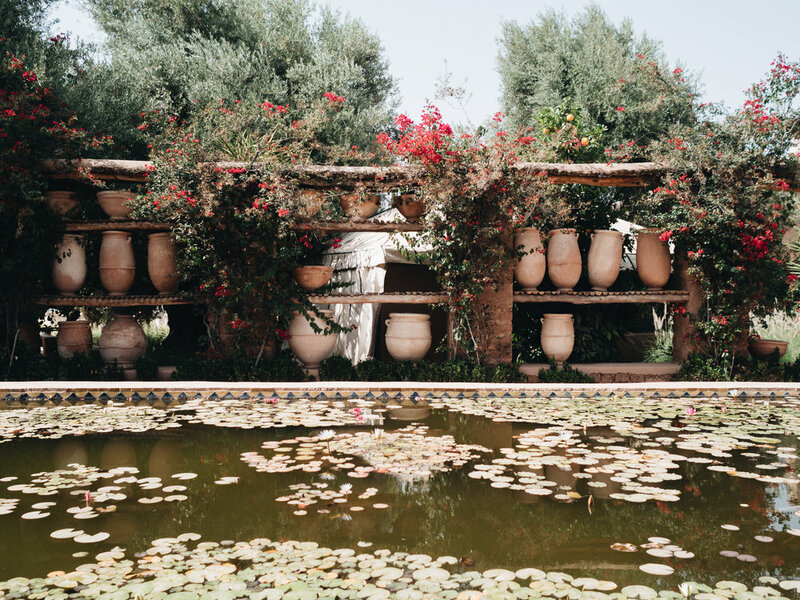 Le Jardin Secret: part of the great tradition of stately Arab-Andalusian and Moroccan palaces, its gardens and buildings are an outstanding examples of Islamic art and architecture. Don't forget to grab some Moroccan tea from the bar above the main building! BELDI Country Club:This place has a hotel, a restaurant, a SPA and a swimming pool all in one. We only stopped by for lunch, but we loved getting lost in all the beautifully designed spaces after. At Beldi you can also find huge greenhouses decorated with local rugs in local materials. To sum it up: we didn’t have the best time in Marrakech - but we definitely plan to go back to Morocco (yes, despite having a not-so-good experience we do want to go back) and explore the Blue City, Chefchaouen, stay in the desert and drink more Mint tea!